Having planned a trip to the U.K., Jason Bangerter Executive Chef of Langdon Hall, provided me with an introduction to Mosimann’s in London. As most people in the know recognize, Mosimann’s is one of London’s premiere private clubs run by none other than Michelin-starred chef Anton Mosimann (OBE). The son of Swiss restaurateurs, the esteemed chef has hospitality in his blood, so it was natural to follow in his parent’s footsteps, first helping in the family restaurant where his love for all things culinary began. At 15 he apprenticed at a local hotel and received the coveted Chef de Cuisine Diploma, at just 25. Three years later, he was Maître Chef des Cuisines at the famous Dorchester Hotel in London and during his 13-year tenure was awarded two Michelin stars, a first for any hotel restaurant outside of France. In 1988 Mosimann acquired a Scottish Presbyterian church in Belgravia and created his first namesake restaurant, an exclusive Dining Club. After the club, came Mosimann’s Party Service, which earned him the Royal Warrant of Appointment to HRH the Prince of Wales for Catering Services. He even catered the wedding of Prince William and Kate Middleton, hosted by Prince Charles. Next came The Mosimann Academy in Battersea, with its phenomenal list of cooking courses and an extensive library of over 6,000 cookbooks. Both of Anton’s sons, Philipp and Mark, joined Mosimann’s in 2007 bringing their impressive experiences throughout Europe’s culinary industry, into the family business. Chef does not like chaos in the kitchen, unlike some I’ve been exposed to, this is a quiet, clean and peaceful kitchen (no shouting or yelling) with what appears to be an unflappable staff working like a well-oiled machine. 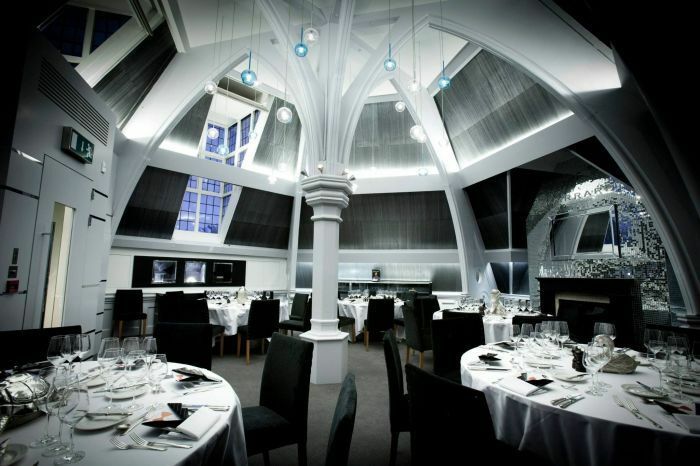 The dining club has seven private dining rooms of various sizes. They are brilliantly designed and individually sponsored by distinguished marques including Lalique, Bentley, Montblanc, Parmigiani, Fleurier and Garrard. The Montblanc Room (for two) is probably the world’s smallest private dining room, enchanting and at the same time sensual, with oyster colored walls highlighted by a magnificent crystal chandelier. The Lalique Room seats 12 and is magnificently designed in muted hues of oyster, chrome and steel tones. But it’s really all about the crystal; the chairs have crystal buttons, the table top is fashioned from a single, solid piece of glass and each table foot is comprised of 551 pounds of pure Lalique crystal, a beautiful piece of art. The stairway walls are lined with photographs of Anton Mosimann with dignitaries including Bill Clinton, Jimmy Carter, Princess Diana, Prince Charles and celebrities who have visited the club. It’s a historical time capsule of who’s who on the public stage. One of the most beautiful rooms, oddly enough, is the ladies powder room, tastefully designed to resemble a Parisian boudoir. The décor simply transports you to another time. Perched up in The Balcony Bar on Mezzanine level affords guests beautiful views of the dining room below. The Bar, with its leather club chairs is warm, plushy and comfortable. This is where I spent an evening with Mark Mosimann, enjoying the club’s excellent cuisine. Mark joined Mosimann’s after four years in Shanghai where he was General Manager of the Laris restaurant. The eatery is known for its food that is not only good, but good for you or “cuisine naturelle.” They reduce the use of salt and sugar, always use the freshest of ingredients (it’s a cardinal sin not to), and, where possible, substitute natural yogurt, fromage blanc and tofu for oil, butter, cream and alcohol. Mosimann’s signature menu includes classic, well-loved dishes like Scottish salmon and Dorset crab, mushroom risotto (Queen Mother’s favorite dish), roast lamb and Anton’s famous bread and butter pudding. Some items on the menu have been served since the restaurant opened 25 years ago, such as the pudding that is light and fluffy, almost like mousse and extraordinarily delicious. There are also house wines and Champagne bottled under Mosimann’s private label. The Champagne is sourced from Epernay, and the wine cellar features the finest collection of wines, housed in a glass room, visible to all. While I enjoyed the marvelous cuisine, Mark filled me in on his life between graduating from the Lausanne Hotel Management School and heading to Mosimann’s. His work experience took him to many fine establishments in Switzerland, Beijing, London and then San Francisco. Once dinner was finished we were offered Champagne truffles and a sampling of petit fours. Anton is still chairman of the company, but with Philipp and Mark managing the club, cooking school and catering business, he’s been allowed the time to do the things he loves the most: travel and cook around the world at private events.